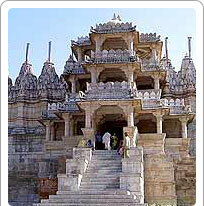 Ranakpur is counted among the five holy places of the Jain community and is among its most important pilgrimages. The main Jain temple here is believed to have been built in the late 14th to mid 15th century period. The Ranakpur Jain Temple is a visual delight made in marble. Dedicated to Adinatha, this is a large temple occupying an area of nearly 60 x 62 meters, has twenty-nine halls and 1444 carved marble pillars. The intricacy and detail on these pillars has to be seen in person; no photograph can do justice to their beauty as no two pillars are alike. There is a beautiful carving made out of a single marble rock with 108 heads of snakes and numerous tails. The end of the tails cannot be found; it is carved with such intricacy. The image faces all four cardinal directions. Images of the twenty-four Jain Tirthankaras are carved on the 'mandaps' or porticoes around the shrine with each mandap having a spire adorned with little bells. The bells move with the breeze creating heavenly music around the temple. The assembly hall has two large bells weighing in at 108 kgs. Three storeys high, the temple has four small shrines with eighty spires supported by 420 columns. It is believed that Dharna Shah, a Porwad, commissioned it after being visualising a celestial vehicle in a dream. The temple was made in the reign of and under the patronage of Rana Kumbha, then ruler of Mewar. An architect called Deepaka managed the project. The Ranakpur Jain temple was nominated as one of the top 77 wonders in a contest to select the world's new seven wonders.